Ceiling fans are a must regardless of the season, whether you’re battling summer heat waves, or just trying to get some solid circulation going during other months they can be lifesavers! In mild to hot climates, a ceiling fan is a basic necessity. It helps keep your cooling costs down, thanks to the fact that the best ceiling fans can generate enough air flow to cool down the room temperature by up to 4 degrees. In this review, we will be highlighting the best ceiling fans available in the market right now. If you are looking to equip your home with the perfect solution for the hot summer, the following ceiling fan reviews will help you get the best deal. ** TOP BUDGET PICK ** 4.8/5 52"
** TOP OVERALL PICK ** 4.8/5 44"
Hunter 53237 Builder Plus 4.7/5 52"
Hunter Fan Company 52090 4.7/5 34"
Minka-Aire F843-DK, Wave 4.6/5 52"
This ceiling fan comes with an aesthetic design, beautiful color, high performance, long life, and durable parts. It’s perfect for use in your bedroom, dining room, kitchen as well as your living room. The Hunter 53090 features a WhisperWhirl motor – it is specifically designed to reduce the noise that often accompanies ceiling fans. Moreover, it also becomes quite useful in winter by utilizing the motor’s reverse functionality that will balance the temperature throughout the room. That means you’ll have a noise free room that will improve the comfort of your living spaces year round. Hunter 53090’s dimensions are 1 x 25.2 x 9.1 inches. This size is designed to fit a room of almost any size. The blades, especially, are long enough to provide air movement that extends even to the corners of larger rooms. This model comes with a limited lifetime warranty for the fan motor, and a 1 year limited warranty on parts excluding motor, glass globes, or light bulbs. This is our top overall pick for performance and value. 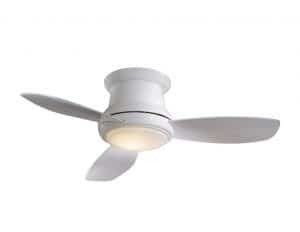 The Minka Aire F518-WH Flush Mounting Ceiling Fan is undoubtedly the best modern ceiling fan. Due to its design, it is simple to install anywhere inside the house. Its three White Blades have an absolutely stunning finish with an integrated 100W halogen light that gives you a perfect air-and-light combination. The powerful motor can generate a blade sweep of 44-inches with just 40-watt power, excluding the light, and delivers an airflow of 4600 CFM with an efficiency of 115 CFM per watt. The small 153 mm by 15 mm spinner delivers 184 RPMs on high speed and 86 RPMs on low speed. Another reason why the Minka Aire F518-WH 44-inch Concept II Ceiling Fan secures the top position in the best ceiling fans reviews is its forward and reverse functions that make it useful throughout the year, not just in the hot summer months. You can control the ceiling fan speed using the AireControl Remote system that gives you three-speed control options in either direction. Small size, sleek look, 75% less installation time and labor, and 10.5-inches hanging depth combine to make the F518-WH Concept II Flush Mounting Ceiling Fan perfect for any room. Yet another model from Hunter, this one has accumulated massive popularity and positive feedback from hundreds of online customers. 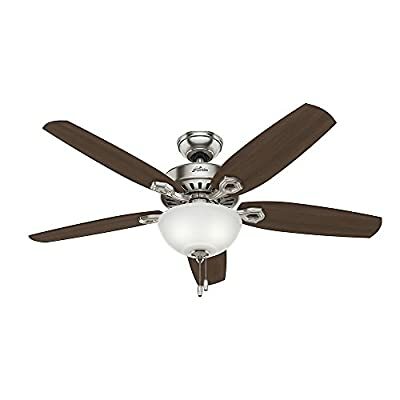 Hunter 53237 Builder Plus 52-inch Ceiling Fan features a unique 5-blade design with Brazilian Cherry color, marble glass light, and nickel finish. If you have a large room with a low-to-high ceiling, this 52-inch ceiling fan is the perfect choice for you. Hang it according to your needs because it offers several options for mounting; flush mount, standard mount or angled mount. The most talked about feature has been its powerful motor, which is good seeing how the motor is the crux of any fan. The motor features Hunter’s exclusive technology and offers ultra-quiet performance throughout the year. The fan remains wobble-free and allows for customizable speed with three different levels; low, medium, or high. Moreover, the fan motor offers a limited lifetime warranty so that you can replace or repair it at any time. You may be wondering about the motor’s energy efficiency given its airflow capacity of 5049, but it does quite well. It operates perfectly at 120 volts and consumes 60 watts. This fan is UL certified and promises to make your room more comfortable and cooler than ever before. Need a quality fan solution for a small room? 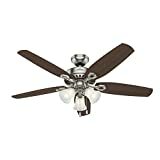 Hunter Watson 52090 34-inch Bronze Ceiling Fan is a great fit for small rooms. This ceiling fan is a prime example of classic design with modern technology, featuring 5 Walnut Blades quoted with Dust Armor nanotechnology that prevents up to 58% of dust build-up. 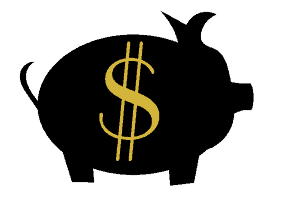 This means your maintenance cost will reduce significantly. If you’re concerned about the height, Hunter Watson 52090 gives you three mounting positions; flush mount, angle mount, and standard mount. So, it’s up to the installer’s choice how to hang it in the room. Performance wise, the Hunter Watson 52090 is not among the most powerful fans, as it offers an air flow capacity of 3516 CFM, but its WhisperWind motor ensures noise-free operation year round. Adding to its forward/reverse functionality, this ceiling fan comes with a limited lifetime warranty on the motor making it a solid value for the price. When it comes to modernization, nobody can compare with Minka-Aire ceiling fans. Minka-Aire F843-DK Wave Distressed Koa 52-inch Ceiling Fan is just the right example of modern fan style and artwork. This particular ceiling fan is tailor-made for large rooms exceeding 485 sq. feet, such as a large office, meeting rooms, libraries, and larger bedrooms. The fan has a metal construction with a brown painted finish. However, it’s not just about design and finish. Minka-Aire F843-DK offers three curved blades with an amazing 48-degree pitch. It’s this design that allows the fan blades to attain such a high pitch resulting in the ceiling fan can generating 6585 CFM airflow capacity, even with only three blades. Even with such long blades, the overall weight of the fan is just 19 pounds. 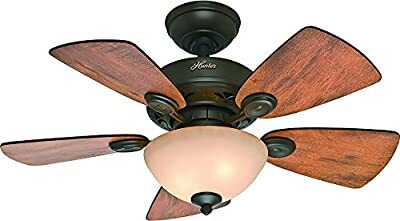 Minka-Aire Wave Distressed Koa F843-DK consumes 66 watts, which is just above a normal ceiling fan’s requirements, yet its energy consumption is as low as normal models. The ceiling fan is UL listed and comes with a lifetime warranty. The Minka-Aire F843-DK might seem expensive, but when you consider its contemporary design, unmatched painted finish, and warranty, the price is reasonable for the value. Plus, the UL certification provides some long-term peace of mind. Why Do You Need Ceiling Fans? Ceiling fans are the best source for air circulation – To remove stagnant air or lingering odors from a still room, ceiling fans are a go to. They create an air current and circulate air to all corners of the room. As the air circulates, it both cools and freshens. Keep in mind that the fan blades should be at least 7-feet above the floor for optimum effect. Ceiling fans help save money – While air conditioners can keep the room cooler, they’re quite expensive regarding energy and maintenance cost. Moreover, the cool air generated by ACs needs help to properly circulate around the room. Ceiling fans not only help circulate air and create a more comfortable environment, but they consume little energy and require minimal maintenance. Ceiling fans maintain room temperature – Without air circulation, it can feel warm despite air coming out of an air conditioner. A ceiling fan helps to spread the cool/warm air throughout the room to improve comfort. Thus making the most out of your air conditioning investment. Ceiling fans compliment the theme of your room – Apart from maintaining room temperature, giving you fresh air to breathe, and saving expenses, ceiling fans can complement your room décor and theme as well. Ceiling fans can add extra light to your room – Another value addition of ceiling fans is the lighting they provide. Some ceiling fans may lack built-in lights, but you can typically retrofit them with light kits should they lack any. It’s highly unlikely that all the rooms of your home have similar wall colors and themes. So, why would all the rooms have ceiling fans with only one style? Manufacturers have taken care of customers’ aesthetic needs and have created a variety of ceiling fan designs. The above mentioned best ceiling fan reviews are based on several common and popular styles. The following describes some of the different style options that are available so that you may choose according to your aesthetic requirements. 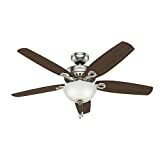 Metallic and wooden materials are the basic elements of Mission Style Ceiling Fans. These fans consist of a dark metallic motor attached to wooden blades. Although the name is derived from the Spanish Missions in colonial California settlements, the aesthetics of this style relates more to the arts and crafts movements of America. So, if your room and its walls are filled with arts and crafts, this fan could compliment them well! For a room, log cabin, or any place in a lodge where you have a space to display a rustic vibe, your first choice should be a Rustic Style Ceiling Fan. As the name indicates, the ceiling fans have inspirational design features that can remind anyone of the flora and fauna of the countryside. They’re well designed, but possess a complicated rugged look to support the rural room décor. You can find a lot of variety in terms of design and creativity. Your kid’s room may have a unique theme that can only be complemented by a particular style of ceiling fan. These fans are available in a large variety of design, color, and size, to keep up with your child’s imagination. These fans usually have bright and lively colors and are based on sports, cartoon characters, or a kid’s favorite toy. If you want to show a mix of contemporary and traditional elements in your house, you may prefer a Transitional Ceiling Fan to provide the finishing touches to your rooms. As the name suggests, these are hybrid fans connecting two separate worlds; less geometrical than contemporary fans, and one step forward from old-fashioned designs. Due to their flexible design, you can install them in transitional-to-contemporary settings. A built-in light is a prominent feature of this particular style. How to Choose the Best Ceiling Fans? Ceiling fans are available in a large variety of designs, shapes, and sizes. This is more than enough to confuse anyone. So, if you’re looking to replace your ceiling fan, or buy one for your workplace, you need to make sure it fits your requirements. Here are some tips to keep in mind when you are going to choose the best ceiling fan. To minimize the cooling cost, ceiling fans with Energy Star certifications are an important feature. Energy Star certification is awarded to those ceiling fans that meet energy efficiency requirements stipulated by the U.S Environmental Protection Agency. The size of a ceiling fan matters the most; otherwise, you’ll end up purchasing something that does not fit the size or needs of your space. Consider that the length of ceiling fan blades start from 29 inches and reach up to 60 inches, size does matter! First of all, you need to measure the dimensions of the room where the ceiling fan will be installed. If your room is below or equal to 75 square feet, you can buy a small ceiling fan with a 29 – 36-inch blade. If the room dimensions fall between 76 sq. feet and 144 sq. feet, the length of the blades should be between 36 inches to 42 inches. The above-mentioned dimensions are for square-shaped rooms. For larger, yet narrower rooms, you might need two or more medium sized ceiling fans, instead of one large ceiling fan. Before installing a ceiling fan, make sure it is mounted in the middle of the room, or at least 18 inches away from the wall. Additionally, the face of the fan should be at least 7 feet above the floor to avoid accidents. For optimal airflow, a height of 8 to 9 feet is recommended. Standard position: standard mount comes with a metal pipe called a “downrod” that’s 3 to 5 inches long. This pipe stretches from the ceiling bracket to the top of the fan to create some space between the fan and your ceiling. Standard mount is suitable for 8 to 9 feet high rooms. Extended mount: an extended mount is available for higher ceilings. An extended mount helps the ceiling fan achieve and maintain maximum airflow inside the room. They’re available in the range of 6 inches to 120 inches and are suitable for 9-20 feet ceilings. Keep in mind that a ceiling fan delivers the best airflow if it hangs 8 to 9 feet above the ground. Sloped mount: for angled or vaulted ceilings, you need a sloped mount ceiling fan. Sloped mount systems are specifically designed to keep the fan blades hanging parallel to the ground. Flush mount: for ceilings lower than 8 feet, you’re going to need a flush mount system. The fan sits flush against the ceiling and maintains a safe distance of at least 7 feet from the ground. However, flush mounted ceiling fans may not deliver maximum airflow as they’re a bit closer to the ceiling. They’re also known as a hugger or low-profile fans. As mentioned before, CFM represents the airflow efficiency of the ceiling fan. The best ceiling fans are the ones that offer airflow of more than 6,000 CFM (cubic feet per minute). Also, consider airflow efficiency labels. Airflow efficiency is the maximum airflow of a ceiling fan at its maximum speed for a given amount of power. The higher the airflow efficiency, the better it is in terms of cooling cost. Ceiling fans are ranked and priced on the basis of their motor rating. Ceiling fans with a motor rating of 5+ use DC motors and are usually in the range of $400 and $1000. Economy grade: a ceiling fan with an economy grade motor is less expensive, and only recommended for 8-hour continuous usage on a daily basis. Economy grade ceiling fans work best with low ceilings, but they may create some wobbling and noise. Medium grade: these ceiling fans can run 12 hours a day, have a medium grade motor, and may be the right fit for your home, but often noise can be an issue. Blades are another important consideration when choosing the best ceiling fan for your situation. Number of blades: while traditional ceiling fans have three blades, some models can have up to 5 blades. Less power is necessary to rotate a 3-bladed fan as compared to a 5-bladed fan. On the other hand, 5-bladed fans are quieter and deliver higher airflow. Angle of blades: pitch of the blade determines the airflow efficiency. For maximum airflow, consider 12” to 14” pitch. All in all, ceiling fans are a basic requirement for any home setting. They improve the comfort of almost any home in a variety of different climates. Ceiling fans are also helpful in reducing your energy cost. To choose the best ceiling fans, you need to consider many factors other than price. Energy Star rating, motor grade, the number of blades, airflow efficiency, and voltage intake are some prominent factors to consider. Last but not the least, you have to consider your aesthetics and lighting needs. Ceiling fans are a normal part of our lives. Perhaps this is why we don’t pay too much attention to them. However, they continue helping to make our lives cooler and more comfortable. Imagine how people in warmer climates would survive hot summer days without these whirling wonders. Here are some common questions people have, or should have, in mind while buying ceiling fans for their homes. Q.1: What’s the best ceiling fan size for my room? Ceiling fans are available in different sizes to accommodate different spaces. For 11ft x 11ft or smaller rooms, you need 36-inch or 42-inch ceiling fans. Fans can reach up to 60-inch in diameter for large rooms. For smaller places, 30-inch sized ceiling fans can be appropriate. Q.2: What is CFM rating and how is it useful in buying a ceiling fan? CFM is an abbreviation for Cubic Feet per Minute and indicates the airflow capacity of a ceiling fan. Generally speaking, the higher the rating, the better the fan. A normal sized ceiling fan generates airflow speed of around 6,500 CFM. Q.3: What are the best ceiling fans? 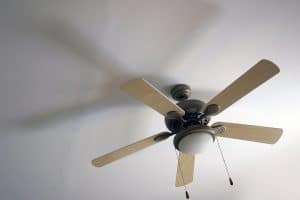 Airflow, quality, and the energy efficiency of a ceiling fan all contribute to making it the best or worst ceiling fan. A ceiling fan gives high performance because of high-quality blades, the blade pitch and size, the degree of separation of blades, and the number of blades (3 to 5). Even with all these in minds, you also don’t want to forget its aesthetic value. Q.4: What factors should I consider when comparing ceiling fans? Q.5: What about a tower fan? Tower fans are good options to complement the airflow of a ceiling fan or when a ceiling fan is not appropriate for the room size or layout. Q.6: How can I make sure my ceiling fan is rotating in the right direction? During summer, the fan blades must rotate forward, counter-clockwise for cooling. In winter, they should rotate clockwise. You can flip the switch available on the motor to change direction. Q.7: My fan makes too much noise, why? To start with, low-quality ceiling fans can cause such issues. Even the best ceiling fans, if installed improperly, can lose balance and makes noise. You can tighten the screws and refit the light kit to see if the problem still exists.